What are their results on independent, industry-standard benchmarks? Perhaps you’ve heard from other providers that benchmarks are irrelevant. If that’s what you’re hearing, maybe you should be asking yourself why? Independent, industry-standard benchmarks are important because they help you measure price and performance on both common and complex analytics workloads. They are essential indicators of value because as data volumes grow, it is vital to get the best performance you can at the lowest price possible. 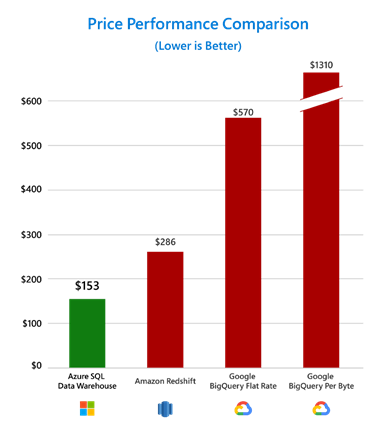 In February, an independent study by GigaOm compared Azure SQL Data Warehouse, Amazon Redshift, and Google BigQuery using the highly recognized TPC-H benchmark. They found that Azure SQL Data Warehouse is up to 14x faster and costs 94 percent less than other cloud providers. And today, we are pleased to announce that in GigaOm’s second benchmark report, this time with the equally important TPC-DS benchmark, Azure SQL Data Warehouse is again the industry leader. Not Amazon Redshift. Not Google BigQuery. These results prove that Azure is the best place for all your analytics. This is why customers like Columbia Sportswear choose Azure. Can they easily deliver powerful insights across your organization? Insights from your analytics must be accessible to everyone in your organization. While other providers may say they can deliver this, the end result is often catered to specific workgroups versus being an enterprise-wide solution. Data can become quickly siloed in these situations, making it difficult to deliver insights across all users. With Azure, employees can get their insights in seconds from all enterprise data. Data can seamlessly flow from your SQL Data Warehouse to Power BI. And without limitations on concurrency, Power BI can be used across teams to create the most beautiful visualizations that deliver powerful insights. This combination of powerful analytics with easy-to-use BI is quite unique. In fact, if you look at the Gartner 2019 Magic Quadrant for Analytics and Business Intelligence Platforms and the Gartner 2019 Magic Quadrant for Data Management Solutions for Analytics below, you’ll see that Microsoft is a Leader. Our leadership position in BI, coupled with our undisputed performance in analytics means that customers can truly provide business-critical insights to all. As the TPC-DS benchmark demonstrates, Azure SQL Data Warehouse provides unmatched performance on complex analytics workloads that mimic the realities of your business. This means that Power BI users can effortlessly gain granular-level insights across all their data. The TPC-DS industry benchmark I mentioned above is particularly useful for organizations that run intense analytics workloads because it uses demanding queries to test actual performance. For instance, one of the queries used in the TPC-DS benchmark report calculates the number of orders, time window for the orders, and filters by state on non-returned orders shipped from a single warehouse. This type of complex query, which spans across billions of rows and multiple tables, is a real-world example of how companies use a data warehouse for business insights. And with Power BI, users can perform intense queries like this by easily integrating with SQL Data Warehouse for fast, industry-leading performance. How robust is their security? Everyone is a target. When it comes to data, privacy and security are non-negotiable. No matter how cautious you are, there is always a threat lurking around the corner. Your analytics system contains the most valuable business data and must have both stringent security and privacy capabilities. Azure has you covered. As illustrated by Donald Farmer, a well-respected thought leader in the analytics space, analytics in Azure has the most advanced security and privacy features in the market. From proactive threat detection to providing custom recommendations that enhance security, Azure SQL Data Warehouse uses machine learning and AI to secure your data. It also enables you to encrypt your data, both in flight and at rest. You can provide users with appropriate levels of access, from a single source, using row and column level security. This not only secures your data, but also helps you meet stringent privacy requirements. Azure’s leading security and data privacy features not only make it the most trusted cloud in the market, but also complements its leadership in other areas, such as price-performance, making it simply unmatched. To learn more about Azure’s industry-leading price-performance and security, get started today! Gartner Magic Quadrant for Analytics and Business Intelligence Platforms Cindi Howson, James Richardson, Rita Sallam, Austin Kronz, 11 February 2019. 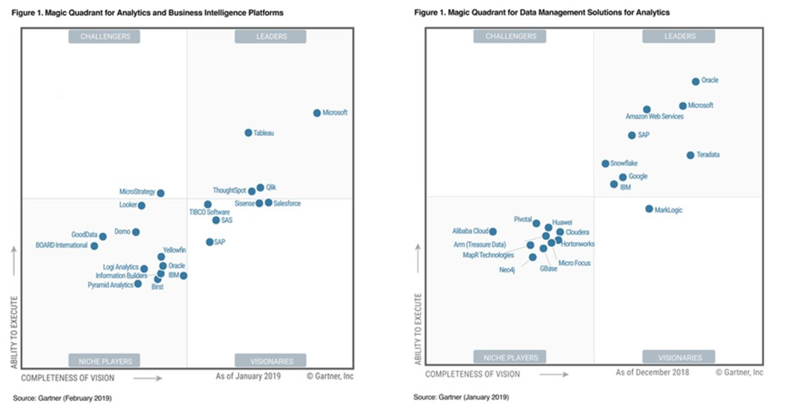 Gartner Magic Quadrant for Data Management Solutions for Analytics, Adam Ronthal, Roxane Edjlali, Rick Greenwald, 21 January 2019.